If you're looking for a way to explore your creative side while pursuing a lucrative career, you may consider earning your art master's or art history master's online. Today's online art history master's degrees prepare you for prestigious positions as museum curators, college professors, and art directors in advertising, design, and film. Not only is job growth on the rise, especially for art directors with specialized web design skills, but earning potential also looks promising, with professionals in this area of art and art history earning an average of nearly $90,000 a year. When it comes to art and art history degrees, you have your choice of a variety of majors and programs. Whether you are looking for a traditional fine art program or interested in exploring an emerging field like curatorial or museum studies, it is critical to start by narrowing down your list to include only accredited degrees from reputable schools. While requirements vary, a fine art degree typically includes hands-on studio experience in visual or performing arts, supplemented by core and elective courses in the humanities and liberal arts. Most online art history master's focus on building a comprehensive foundation in the major movements of artistic expression throughout history around the world. Though traditional art and art history degrees have been in existence for decades, programs focused on curatorial studies and other museum professions are still an emerging development at most colleges and universities. Some schools now offer programs centered on preparing graduates for employment as museum curators or gallery directors in a specific genre of fine art. Others emphasize a unique combination of art history and archaeology skills. The primary difference between an art and art history degree is that the former encompasses mostly studio practice, while the latter is centered on research and lecture-based coursework. Both programs end with a thesis or capstone exhibition or project. Fort Hays State University ranks #1 on The 6 Best Online Master's in Art & Art History Programs! Located in Hays, Kansas, Fort Hays State University offers a master's in liberal studies with an online concentration in art history. Facilitated through Fort Hays' Virtual College, this master's program provides synchronous and asynchronous classes to foster your engagement with the field of art history. The master's in art history online prioritizes critical thinking through four core classes focused broadly on liberal arts, humanities, and information literacy. In these courses, students learn how to identify, deconstruct, and rebut theoretical frameworks. Students will then move on to 18 credit hours in an art concentration. Areas of focus include ancient and medieval art history, renaissance and baroque movements, and 18th- through 20th-century art. Finally, master's students are required to enroll in one course on historical readings, which delves into critical research and evaluates historical problems within the field of art. 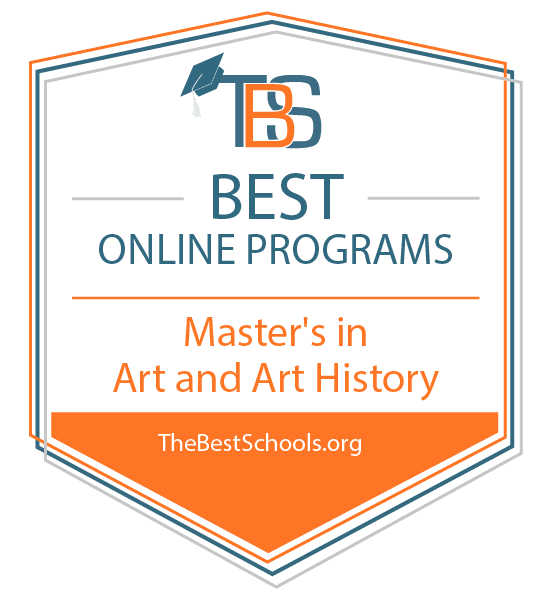 To apply to the online master's program, participants must hold a bachelor's degree in art history or studio art, with at least 12 hours of prior art history study at the undergraduate level. Fort Hays also participates in the Department of Defense Voluntary Education Partnership Memorandum of Understanding, which offers tuition assistance to active service members in the U.S. Navy. Fort Hays State University is accredited regionally by the Higher Learning Commission of the North Central Association of Colleges and Schools (HLC). University of Nebraska at Kearney ranks #2 on The 6 Best Online Master's in Art & Art History Programs! The University of Nebraska at Kearney offers an online master's in art education with an emphasis in either museum education or K-12 classroom education. Both programs require 36 credit hours and function 100% online. UNK's online master's in art education requires four core courses including an introduction to theoretical philosophies of art education, multiculturalism in classroom and museum settings, and curriculum development. Electives include classes on non-western art history, modern art history, and photography. More specifically, museum educators focus on art criticism and philosophy while classroom educators may take courses on art methods for young children and art education in American culture. The master's culminates with two research classes, which allow for independent research and a required thesis. Applicants to UNK's online art education master's program must hold a bachelor's degree in art history, museum studies, education, or studio art. Participants may transfer up to nine semester credit hours from an accredited institution. Students may also pursue up to six credits of independent study. The University of Nebraska at Kearney is accredited by the Higher Learning Commission (HLC) and the National Council for Accreditation of Teacher Education (NCATE). Azusa Pacific University ranks #3 on The 6 Best Online Master's in Art & Art History Programs! The online art history master's degree at Azusa Pacific University in Azusa, California, covers modern and contemporary art history. In this two-year, 36-unit program, students review recent historical developments in the field and engage with contemporary art issues. A Christian institution, Azusa seeks to instill personal, intellectual, and spiritual growth in its student body, regardless of personal faith orientation. Azusa's online master's in modern art history offers its required 12 courses in eight-week sessions. Because all classes are asynchronous, students can work full-time while attending school. The program's coursework includes 19th- and 20th-century art criticism and theory, art historical methodologies, and regional modernist movements. After completing the core curriculum, students produce a final thesis, which is oriented over two consecutive courses: the first helps students formulate research questions and hone their investigative skills, and the second gives students the space to compose their project. Finally, by the end of the program, participants must prove proficiency in one foreign language relevant to their research interests (the program suggests French, given the numerous 20th-century theoretical texts composed in the language). Azusa's modern art history master's online is accredited by the National Association of Schools of Art and Design (NASAD). Furthermore, Azusa Pacific University is regionally accredited by the WASC Senior College and University Commission (WSCUC). Northwestern State University of Louisiana ranks among The 6 Best Online Master's in Art & Art History Programs! For those interested in a degree in art practice, Northwestern State University in Natchitoches, Louisiana, offers a master's degree in art production. Taught almost entirely online, Northwestern State's online master's of art in the study of fine and graphic arts features specializations in studio design, photography, and new media. While most courses are taught virtually, all students must participate on campus in either two three-week summer courses or one in-person semester. Of the 33 credits required for this online master's of art, students may complete up to 27 credits remotely. These courses cover real-world issues for contemporary artists including advanced problems in commercial art production (e.g., painting, crafts, photography, watercolor, ceramics). To complete the degree, students must bring their personal work to campus for a final thesis exhibition, the objective of which is to expose participants to the skills of art presentation, self expression, and personal marketing. Students will produce a final portfolio, which they will take onto the job market. Northwestern State University accepts transfer credits on a case-by-case basis. It also provides career development assistance through the Counseling and Career Services Center. Northwestern State University's online master's of art in the study of fine and graphic arts is accredited by the National Association of Schools of Art and Design (NASAD). The university is also accredited regionally by the Southern Association of Colleges and Schools Commission on Colleges (SACSCOC). Lindenwood University ranks among The 6 Best Online Master's in Art & Art History Programs! Based in St. Charles, Missouri, just outside St. Louis, Lindenwood University offers hybrid and online programs in art history, exposing a range of students to the world of art. Students in the online master's in art history take 36 credit hours, investigating ancient and modern histories of western and non-western art, and contemporary art-related subjects like digital art and gender studies. Additionally, students are required to pass an exam in comprehensive art history, which covers western and non-western cultures. All students must also participate in courses on academic research and composition in preparation for their final thesis or applied project, to be submitted to the faculty for approval prior to graduation. Beyond coursework and independent research, all students must prove competency in either German or French, or in another language relevant to one's personal research. For program participants with a specific professional orientation -- e.g., those seeking a museum administration or curatorial position -- Lindenwood's non-thesis applied project track allows them to plan, document, and present a personal project that best represents their expertise. Like the thesis, this project will be presented to a committee prior to graduation. Lindenwood University accepts transfer credits on a case-by-case basis from regionally accredited institutions: graduate students may transfer up to nine credits. Lindenwood University's online program in art history is accredited by the Higher Learning Commission (HLC). Edinboro University of Pennsylvania ranks among The 6 Best Online Master's in Art & Art History Programs! For professionals dedicated to bringing art education to children and young adults, Edinboro University's online master's in art history is an ideal fit. Edinboro's online master's of arts with an art education concentration is taught entirely online, and can be completed in two years. Applicants must have a bachelor's degree in art education or a related field, and hold prior certification in art education at the time of course enrollment. Over 30 semester hours, students take classes covering current issues in art education, curriculum development, therapeutic art education, and academic research. Participants in the online master's in art history have multiple resources at their fingertips. The university writing center assists with composition and written communication, the academic success center keeps students on track to achieve personal goals, and the center for career development identifies potential career paths for students and sets benchmarks for their success. Edinboro University of Pennsylvania is regionally accredited by the Middle States Commission on Higher Education (MSCHE). Furthermore, the online master's of arts program is accredited by the National Council for Accreditation of Teacher Education (NCATE). Earning your art or art history master's online qualifies you for advanced occupations in art museums, education, and media and design. While a bachelor's degree may be the minimum requirement for some entry-level positions, employers prefer candidates with a master's education and graduate experience in their area of expertise. For curators and college professors of art or art history, a master's degree is typically required. Below are just a few job options for graduates of an online art history master's program. Curators and Museum Workers: Art curators gather and present collections of artifacts and/or works of art for a cultural institution. Museum workers, including registrars and conservators, preserve the items in a museum's collection and keep records of acquisitions, loans, and methods of safeguarding for each piece. While some positions require only a bachelor's degree, most prominent museums in major cities require a master's in art history, especially for curator positions. Postsecondary Teachers: Postsecondary teachers of art and/or art history are required to have an advanced degree in the subject to teach at the college level. While most professors at four-year colleges and universities are required to have a Ph.D in their area of expertise, students with a master's in art and art history are eligible for teaching positions at a community college or vocational school. Additionally, some employers will hire master's degree holders who are current candidates for a Ph.D program. Art Directors: Art directors create the overall look and style of a project, including print publication layouts, films and TV shows, and advertising and marketing campaigns. While many positions require only a bachelor's degree in fine art or graphic design and relevant industry experience, candidates aspiring to a managerial role should have a master's degree or MFA. See also: What can I do with an Art & Design degree?